FileMaker beat several other well-known workplace platforms, including Google App Maker, Airtable, Salesforce Lightning, and others. FileMaker posted the highest combined score both in user reviews and market presence. A visual layout of the various performances of the workplace innovation platforms can be found here. FileMaker boasted the highest overall score in several categories, importantly including workflow automation, data security, and native deployment. We at AppWorks love security, and you can read up on our best practices here. 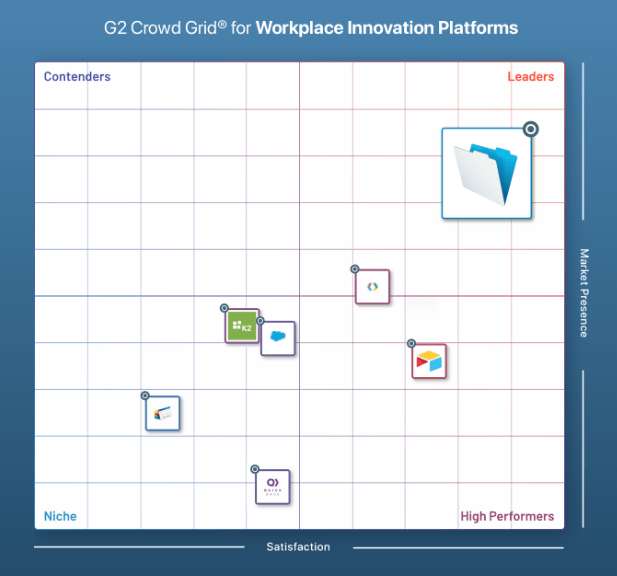 G2 Crowd’s Workplace Innovation Platform is a new category, necessitating a universal definition to aid in classifying whether or not a software system is considered to be classified within this category. Workplace Innovation Platforms first and foremost allow for collaborative app development by both developers and non-developers. This is possible through the offering of both visual and full-stack development tools. Workplace Innovation Platforms are designed primarily to help solve workflow issues not addressed by current applications and platforms, often by linking these external “appliance apps” (such as an accounting system, etc.) to the main workflow system. User-friendliness is a hugely important criterion within this category, as both developers and less tech-savvy individuals are able to contribute to the creation of a workplace innovation platform. FileMaker was recently featured in an article denoting the Top 7 Workplace Innovation Strategies for 2019, which can be found here. The full G2 Crowd Report can be accessed using this link, after submitting minor user details. If you are curious about whether a switch to a FileMaker system is right for you, AppWorks offers a free one hour consultation, during which we are happy to discuss your needs and make recommendations for the best way to move forward. We tend to find that the most common complaints before switching to a FileMaker system include double-entry of data, and too many work processes involving unnecessary paperwork. Contact eleanor@app.works to schedule a consultation.